Kodak EasyShare Z650 is a 6.1MP digital camera featuring 2.0-inch LCD display, 10x Schneider-Kreuznach Variogon optical zoom lens, continuous VGA video with MPEG-4 compression, live histogram, automatic mode or aperture priority and shutter priority modes, plus 17 scene and 5 color modes with on-camera enhancement features, first and last burst modes and flash compensation, and has 32-MB internal memory with an SD card slot. Imaging Resource reviews Kodak EasyShare Z650 and concludes that Kodak EasyShare Z650 brings the renowned EasyShare simplicity and ease of use to the long zoom format, balancing the full complement of exposure modes with 17 Scene modes. The 6.1-megapixel CCD captures high resolution images that make sharp 11×14 prints. The Kodak Z650’s color should appeal to most consumers too, as it’s very bright and vibrant (a good bit more so than the original subjects), yet it doesn’t oversaturate delicate skin tones. With its full range of exposure options, the Z740 would be a great choice for novices who want to grow their skills, while experienced users will immediately appreciate the more advanced features it has to offer. On the down side, the Power switch and popping flash are annoying and the lack of image stabilization makes the 10x zoom less useful under any but the best conditions. More puzzling, Movie mode delivers a lot less than we’ve come to expect from Kodak. Still, at this price, it’s a camera everyone in the family can enjoy on any occasion. And later, EasyShare printing and sharing will extend the pleasure to even more folks. DigitalCameraInfo (dead link) concludes that Kodak apparently strained to hit its price point with the EasyShare Z650, leaving out image stabilization and skimping on the LCD in favor of the lavish electronic viewfinder. We think that the real problem with the camera is its lack of custom white balance – the only piece missing from a very good manual control implementation and a Kodak Color Science Chip. Still, the fundamental impression we take away from the Kodak EasyShare Z650 is one of sharp, low noise images, good color, and a very straightforward user interface. So far it looks promising; check back to see if further testing results seal the deal. 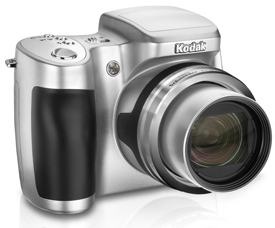 More features, specifications and sample photos at Kodak EasyShare Z650 official homepage (no longer available).